We have vast knowledge and experience in the development, manufacturing and fabrication of Microfludics & Microfluidic devices. Many of the applications range from clinical chemistry, medical, life sciences, biotech, point of care devices, food & beverage analysis and a broad range of In Vitro Diagnostics systems. 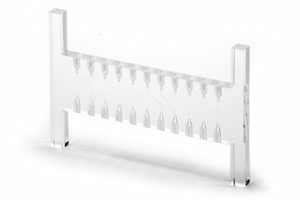 We started to fabricate microfluidics manifolds, devices and microfluidics chips for drug development and point of care testing in 2001. Since then, we have worked with a wide range of companies from high-tech start-ups to global multi-nationals supplying prototype microfluidic devices, disposable diagnostic microfluidic chips, microfluidic lab-on-a-chip, manifolds and flow reducers. 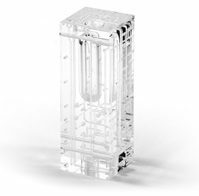 For High Accuracy Diffusion Bonded (HADB) microfluidic devices and chips, we typically use PMMA, and Ultem for more aggressive chemicals or higher temp applications. 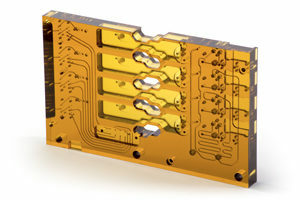 Using our unique High Accuracy Diffusion Bonding (HADB) techniques, we can produce single or multi-layer microfluidic manifolds to very tight tolerances in a highly repeatable production method. We can also machine and polish external layers post bonding down to 200 microns, allowing ultra-clear optical imaging for fluid sample analysis. 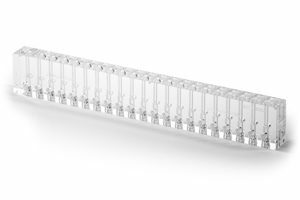 Microfluidic devices contain a number of critical features such as tracks, mixing cells, chambers and optical windows, we can produce tracks down to 150 microns (0.006”) widths. We can support clients in the early stages of design and validation with prototype quantities of microfluidic devices and chips. Generally, we use CNC machining allowing prototypes and the production of small qualities without the need for expensive tooling. 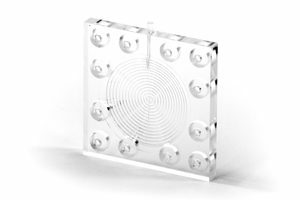 This method also allows a cost effective and flexible way to optimise and freeze the design prior to investing in injection moulding tooling.